A man arrested in connection with the 9,600-acre wildfire burning in Cleveland National Forest was charged Thursday with several arson-related counts. Fifty-one-year-old Forrest Gordon Clark was arrested Tuesday, a day after the fast-moving wildfire started in dry brush and steep terrain near the Riverside and Orange county border. He was charged Thursday with one felony count each of aggravated arson of five or more inhabited structures, arson of inhabited property, arson of forest, criminal threats, two felony counts of resisting and deterring an executive officer, and a sentencing enhancement for arson burning multiple structures. He faces a maximum sentence of life in state prison. Details about how the fire started were not immediately available, but Clark is accused of setting the blaze in the Trabuco Canyon area. At least 14 structures have burned. A court appearance was scheduled for Thursday, but the suspect refused to come out of his cell as of early afternoon. Arraignment was re-scheduled for Friday. A family member declined NBC4's request for a comment Thursday. It was not immediately clear whether Clark has an attorney. 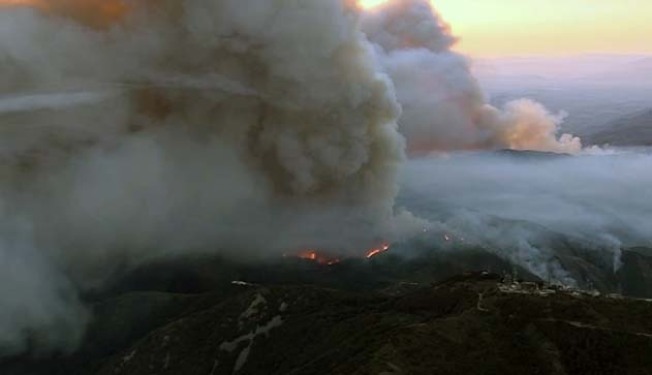 The Orange County Register reported that the suspect owns a cabin in the Holy fire area and allegedly sent an email warning "this place will burn." Volunteer Fire Chief Mike Milligan told the Register that he received the emails last week. "He has issues," Milligan told the Register. "I hope they get him." The Holy fire in Riverside and Orange counties is one of more than a dozen large wildfires burning in California, including the Mendocino Complex -- the state's largest wildfire on record. Major fires also are burning in Shasta County and in and around Yosemite National Park during what could be one of the worst years for wildfires on record in California. The Holy fire is at least the second large wildfire this summer that authorities said was started by an arsonist. Last month, a Temecula man was arrested on suspicion of starting nine fires, including the 13,000-acre Cranston fire in the San Jacinto Mountains of Riverside County. The Holy Fire was first reported about 1:15 p.m. Monday near Holy Jim Canyon and Trabuco Creek roads, according to Orange County Fire Authority Capt. Tony Bommarito. The fire grew to more than 4,100 acres by Wednesday morning. It was less than 5-percent contained. The area has not burned since the early 1980s, leaving hillsides covered in dry brush that provides fuel for the fire. About 600 firefighters were called in to try to encircle the blaze, with the USFS taking the lead, aided by personnel from Cal Fire, Corona, the OCFA and other agencies. California could be facing the toughest wildfire season ever as 12 gigantic blazes ravage the state. Some 14,000 firefighters are battling fires that have destroyed more than 2,000 buildings and claimed at least six lives due to wind-whipped flames that have caused an explosive spread through vegetation left tinder-dry by years of drought. California's largest recorded blaze -- the side-by-side fires dubbed the Mendocino Complex -- needed just 11 days to blacken an area nearly the size of Los Angeles. A deadly fire that destroyed more than 1,000 homes in the Redding area of Northern California is less than 50 percent contained.